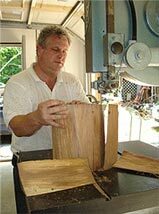 Turning Green: Our urns are turned from a variety of woods, many of which have been reclaimed. Clark finds most of his wood from local arborists. This wood normally would go to the chipper or to a landfill. 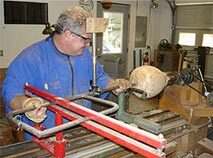 Shavings are used by local gardeners for mulch, and other scrap wood is used to heat his studio and home. 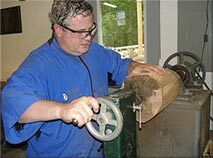 Clark selects his wood for the distinctive grain patterns and colors. 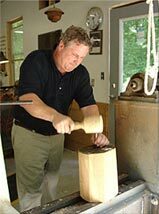 Some of his favorites are Box Elder, Oak Burl, Ambrosia Maple, Cherry, and American Black Walnut. 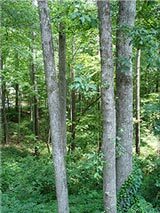 Logs are sawn into blocks called billets. 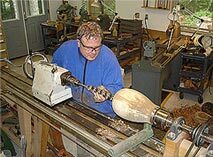 Much of the wood comes from local tree surgeons. Clark roughs in the shape on the band saw. 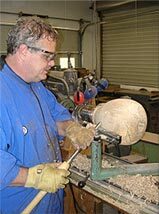 The drive spur must be pounded into the billet so it can be mounted on the lathe. 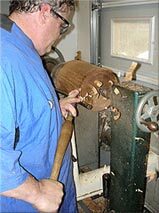 Here Clark is starting the alignment on the lathe. Here Clark is starting the finishing of the exterior surface. 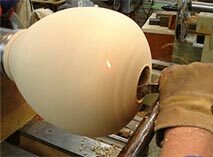 Beginning to shape the top portion of the urn. 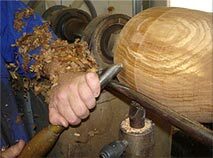 It is necessary to cut and size the tenon on the bottom of the urn. 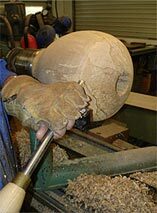 This will be used to mount the urn for hollowing. 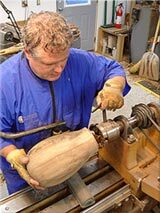 Using the tenon, Clark mounts the rough urn into the chuck for hollowing. 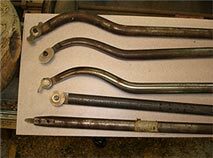 Truing up the outside shape in preparation for drilling. 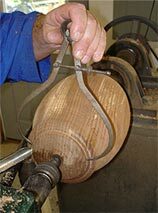 Drilling a 2" diameter hole to the finished internal depth. 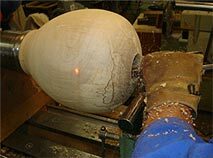 Turning the final shape of the urn. Continuing to refine the exterior. 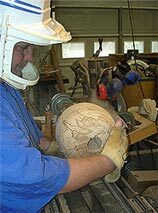 The helmet is for protecting lungs and eyes from the sanding dust. 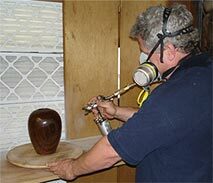 Urns are sanded through a 180 grit. 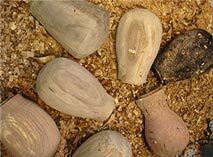 Hollowing tools are used to remove wood from the interior to an even wall thickness. 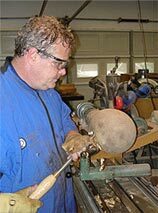 Clark is using a deep hollowing tool to remove the interior material. The "D" shaped brace is captured between the arms of the back rest. Setting up the laser to control wall thickness. 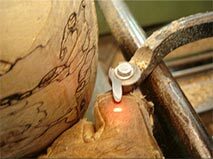 The light indicates the location of the cutter. 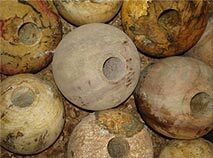 Hollowing is progressing deeper into the urn. 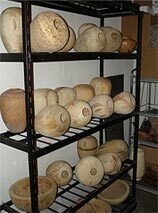 After the turning is complete, the urns are moved into a humidity controlled drying room. Multiple coats of high quality lacquer are applied. Each piece is then hand buffed and waxed.